The theatrical rights are available. Patrick Brown speaks to media following a meeting at the Conservative Party headquarters in Toronto on Friday, February 16, 2018. 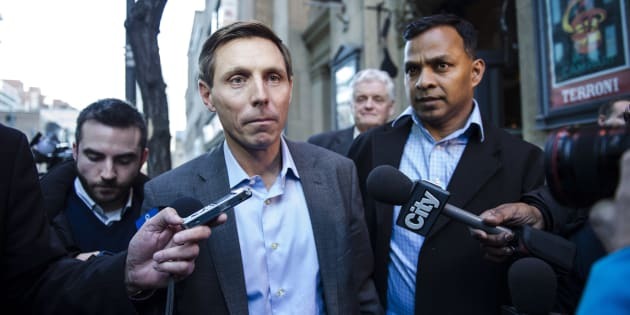 Patrick Brown says the new book, titled "Take Down,'' will chronicle his nearly three years at the helm of the party and offer a detailed look at the events that led up to his abrupt resignation in January. Two women came forward with allegations of sexual misconduct against Brown, who vehemently denies their claims. Brown says his book will be "a story of betrayal, blackmail, and backroom politicking involving some of Canada's biggest political names,'' though he did not provide further details. The book, published by Optimum Publishing International, is slated to hit shelves on Nov. 1. The publishing company said Brown will embark on a full tour to promote the new book. The theatrical rights are available, the company said. Brown's resignation, which came mere hours after the sexual misconduct allegations were first levelled against him, touched off a turbulent time in Ontario politics. While four candidates quickly emerged as contenders for the Progressive Conservative leadership, they were briefly joined by the man who made the race necessary in the first place. Brown officially entered the leadership contest to reclaim his old job, asserting he had cleared his name in a series of press interviews and social media posts that raised questions about the allegations. One alleged victim did eventually alter the timeline of her claims, but stood by the core allegations she raised against Brown. Just five days after joining the contest, however, Brown withdrew once again citing strain on his friends and family. In the meantime, he had been turfed from the caucus he once led and had come under fierce attacks from party members alleging financial irregularities and other allegations of misconduct.